Possession vs. Counterattack — Arsenal obtained their first, truly resounding victory of the season through nullifying the threat of Fulham’s attacking midfielders, before counterattacking into the space behind their back three. Slaviša Jokanović elected to switch Fulham’s starting formation from a 4-4-2/4-4-1-1 to a 3-4-2-1, with Le Marchand and Cyrus Christie slotting into the team for Joe Bryan and an injured Fosu-Mensah as the LCB and RWB respectively. This meant Luciano Vietto and André Schürrle instead played ‘floating’ roles behind Aleksandar Mitrović upfront, while Ryan Sessegnon played a hybrid of his past and present roles, as a LWB. Unai Emery had surprises of his own to make. With Mesut Özil out due to back spasms, Alex Iwobi started instead (despite having played in midweek against Qarabag), with Henrikh Mkhitaryan preferred over Aaron Ramsey. What was more interesting, however, was that Danny Welbeck started over Pierre-Emerick Aubameyang upfront, alongside Alexandre Lacazette, This meant that instead of a 4-2-3-1, Arsenal played something approaching a straight 4-4-2.
although it should be noted that his passing was somewhat ‘safe’ and intended to keep hold of the ball, instead of providing incision. This was fine though, as Fulham weren’t aiming to slice through Arsenal through passing the ball, but by pressing them. or block a simple forward pass into midfield. As a result, Arsenal’s top 5 passing combinations were Holding – Monreal, Holding – Xhaka, Leno – Holding, Torreira – Xhaka and Xhaka – Monreal; the Gunners were forced to hold onto the ball in deeper positions and build up much more slowly. This was in contrast to Fulham’s own build-up. While it primarily focused around the center-backs moving the ball to the wingbacks (their highest pass combination was Le Marchand – Sessegnon and Odoi – Christie), Mitrović’s presence upfront meant that they were capable of playing more directly, with Bettinelli – Mitrovic being their 2nd highest combination. is particularly enlightening; he rarely completed a pass forward (and poor crossing from the wingbacks meant he was often isolated), but he held the ball up well and distributed it to the two players most capable of doing something in this team — Vietto and Schürrle. with their defensive actions occurring around or after the halfway line. Playing a 3-4-2-1 has its benefits against a back 4, especially a 4-4-2 — but what was key here was that Vietto and Schürrle were playing more permanently in the half-spaces, which meant it was awkward for Arsenal’s fullbacks to pick them up, and provided them with a 3v2 against the center-backs. Historically, Arsenal haven’t been able to deal with this formation without using a 3-4-2-1 of their own (we’ll get to that in the next point), but Vietto and Schürrle are of course, not Hazard and Pedro. Still, the two linking up were responsible for the equalizer — an intercepted pass by Monreal turned into two quick passes on the counter, from Anguissa, to Vietto, and finally Schürrle, who drifted to the right and scored. and Vietto mostly looked for a safe pass to the wingbacks or Seri, instead of a more incisive option. And while Mitrović was passing to both players, the reverse was rarely true — neither Schürrle or Vietto looked to play quick one-twos with him, or even to use him as anything, beyond being a target for knockdowns. with the midfielders blocking passes into Fulham’s front three, and the center-backs sweeping up anything that came through. Torreira in particular had a fine performance, constantly nipping in front of opponent to recover the ball (mustard triangles) or to intercept it (blue triangles). Xhaka played a more reactive role, and as a result made more tackles (green) and blocks (yellow). This solid base benefited Arsenal’s front four. I’ve spoken elsewhere about Arsenal’s awkward front four being shoehorned into a starting formation, then being told to move into their more natural positions with the ball, but that didn’t happen today. With and without the ball, Arsenal were broadly a 4-4-2, or 4-2-2-2 if you like, with players starting in much more natural positions. This meant the players didn’t have awkward starting positions, but it’s also important to consider the nature of the starting XI. 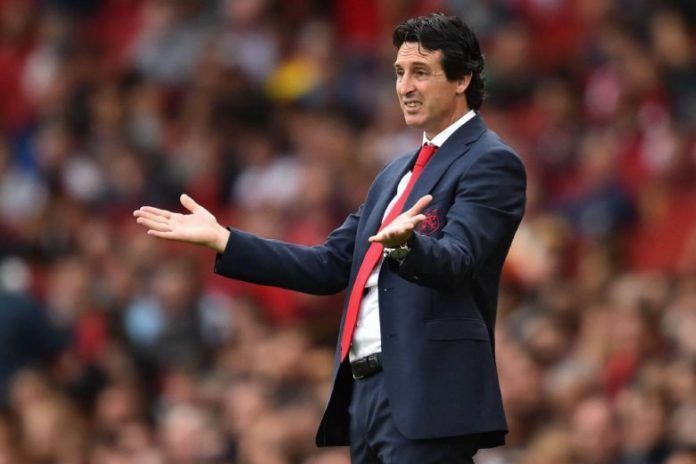 Welbeck, Iwobi and Mkhitaryan have primarily been second-choice attacking midfielders under Unai Emery, but they provide a versatility that their first-choice counterparts do not, especially with their ability to move out onto the touchline, or to play in the half-spaces. Here, that versatility shone. Mkhitaryan was a much more natural fit on the right, drifting into pockets of space where he could shoot or pass. ](https://imgur.com/rBUYgWQ) What was better, however, was his in-to-out movement, with his pass map a good example of his comfort in central or wide areas. As a consequence, he left Bellerin less isolated than Özil would. Welbeck didn’t register a single shot at goal, but his workrate and pace ensured that Arsenal could move up the pitch better, and he regularly attacked in the left-sided channels, trying to play a simple pass across goal for one of the onrushing attackers. As for Lacazette, he played more of a false nine role, dropping deep before playing a pass for a midfield runner. What was more impressive, was that he still managed to get two goals despite playing so deep; this was a performance that 2012 Messi would have been impressed by. The true star of Arsenal’s front four however, was Iwobi. There’s a good chance that Iwobi wouldn’t have started against Fulham, had Özil been fit — he had after all, been playing against Qarabag in midweek. But he showed no signs of exhaustion, and was probably Arsenal’s best attacker. Like Welbeck, Iwobi found a lot of joy running down Fulham’s right flank, with wingback Christie having a horrid performance, often caught out by his in to out movement, outside and around the back three, before looking to play a pass into the box. He didn’t always succeed, but his direct running exposed the space behind Fulham’s high defensive line, and he would prove vital to the first Arsenal goal — Lacazette drops deep, plays a pass to Iwobi, who drives forward and finds Monreal, who then plays the Iwobi role by passing sideways into the box, for Lacazette to finish off the move he’d started. A fitting goal, given the nature of Arsenal’s play. Welbeck’s role was also important here, as he often drifted to the left flank to allow Iwobi to rampage forward unchecked. It’s difficult to think of say, Ramsey or Özil playing such a selfless role for another creator — and perhaps highlights that the 11 best players aren’t always the best starting XI. Still, Arsenal only turned this match into an actual trashing after Iwobi was substituted for Ramsey, with Aubameyang having come on 5 minutes earlier. It should be noted that despite the scoreline and balance of play, Fulham had went into the break 1-1, and only a stunning Lacazette goal from outside the box restored Arsenal’s lead. This caused Jokanović to swap to a 4-4-2, with Ream subbed off for Kamara. This however, only made things worse. One, Schürrle and Vietto were now playing deeper, and therefore unable to influence the play as they had in the first half. Two, Fulham’s wingbacks continued to play as wingbacks, and not fullbacks — this is an important distinction to make, as without an extra defender, it meant Fulham were much more exposed, especially down the flanks. The knock-on effect was that Christie actually made 5 key passes, but on a rewatch, only 2 of them led to good goalscoring situations, with one a bad Kamara shot, and another a Mitrović shot that went straight into Leno’s hands. These factors all played a role in goals 3, 4 and 5. Ramsey’s goal, scored barely after he came on, owned much to Fulham’s exposed defense. They pushed up high and were left with a 4v2 situation to defend — an incredibly suicidal act, especially against a top side. For Aubameyang’s first, Sessegnon is caught lazily jogging back while Bellerin overlaps forward, which leaves him free to receive a long crossfield pass from Mkhitaryan, and free to assist Aubameyang. The second Aubameyang goal is less clear, but Ramsey is left free to receive a pass between the lines, without a midfielder or defender pressuring him. All of this points not just to sloppy defending, but also to an inability to adjust to different tactics mid-match, and perhaps an inability by Jokanović to understand the limitations of his players. Surely a deeper defensive line, coupled with fast players to counterattack, would have been ideal against Arsenal? This was Arsenal’s finest performance of the season. Not only did the front four look much better, with versatile forwards smoothly interchanging — instead of the awkward Lacazette/Aubameyang/Ozil/Ramsey quartet we’re used to seeing — Torreira and Xhaka were hugely impressive, with both helping to counter the unusual threat posed by Fulham’s ‘2’ behind the striker, while Holding, Mustafi and Leno continue to quietly impress. However, Fulham’s aggressiveness played a key role in the scoreline, and while the Gunners should be praised for such an utter victory, more time is required to determine whether this was a one-off, or a sign of things to come. As for Fulham, there isn’t a lot to glean from their performance. Neither the 3-4-2-1 or the 4-4-2 showed a lot of promise either; the former was torn apart by Arsenal’s wide players, and the latter did not suit Fulham’s players, with Christie and Sessegnon uncomfortable as fullbacks, Seri and Anguissa not quite defensive enough to shield the defense, while Vietto and Schürrle were isolated in deeper positions. It’s commendable to play proactively, even aggressively against a much better side (on paper). But continuing to play in that way, and conceding multiple goals from doing so, is nothing short of suicidal, with their single goal indicating that counterattacking and defending deep would have been a better approach.